The hero image for the 2018 edition of 6 Degrees Toronto is “Oceti Sakowin,” by Canadian photographer Amber Bracken. The photo is part of Bracken’s 10-image series, “Standing Rock,” which was awarded first prize in the Contemporary Issues category of the 2017 World Press Photo contest. 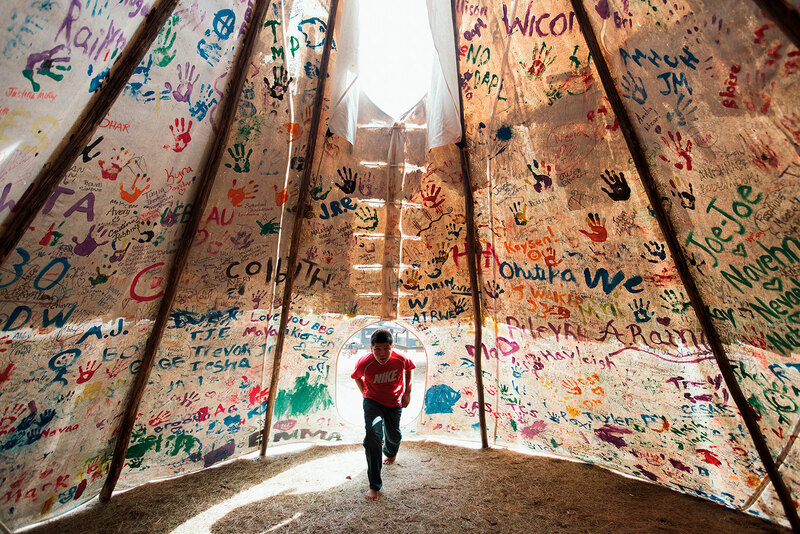 This year’s hero image captures an individual, while still evoking a collective through the handprints, names, drawings, and messages painted on the teepee. The senses of community and of individual expression are both palpable. The image evokes movement, momentum, and imminent engagement—the boy is looking directly at us and walking straight towards us. The image is open to interpretation—the purpose of the handprints, names, drawings, and messages painted on the teepee is not immediately clear. The exact location of the teepee is unknown. What lies beyond the teepee is unseen. All of this ambiguity invites further scrutiny by the viewer. The image is complex—details only reveal themselves after repeated viewings and careful examination, from what some of the messages actually say to what the boy is wearing (a t-shirt bearing one of the world’s most recognizable corporate logos, Nike’s) and not wearing (shoes). The image reflects the thematic elements of this year’s 6 Degrees Toronto—inside/outside, public/private, and citizenship now. You can read more about our theme here. In the photo, 12-year-old Jesse Jaso enters the Unity Teepee at the Sacred Stone protest camp near Cannon Ball, North Dakota, U.S.A., on September 10, 2016. The teepee is signed by people from around the world in protest against the Dakota Access Pipeline. Oceti Sakowin, or Seven Council Fires, was a seven-member confederacy of Sioux peoples. Edmonton-based Amber Bracken’s work has been published by National Geographic, The Globe and Mail, BuzzFeed, Reuters, Maclean’s, Canadian Press, Postmedia, and Canadian Geographic, among others. Her photos reflect her interest in the intersection of photography, journalism, and public service, with a special focus on issues affecting Indigenous people. With the rise of movements like Idle No More, communities are increasingly empowered to fight for a more just relationship between governments and non-Indigenous people. Bracken is always looking for ways to represent and foster the strength of these communities. With that intention, she is building relationships in Indigenous communities and documenting important issues around culture, environment, and the effects of intergenerational trauma resulting from colonialism.